After representing West London Schoolboys, he was recommended to Blackpool by his teacher, the son of former Blackpool and England legend, Harry Johnson and he was taken on as an apprentice at Bloomfield Road. He signed professional forms at Blackpool in August 1976. Chandler’s displays on the left side of midfield made him an effective player and he soon attracted attention from the bigger clubs. 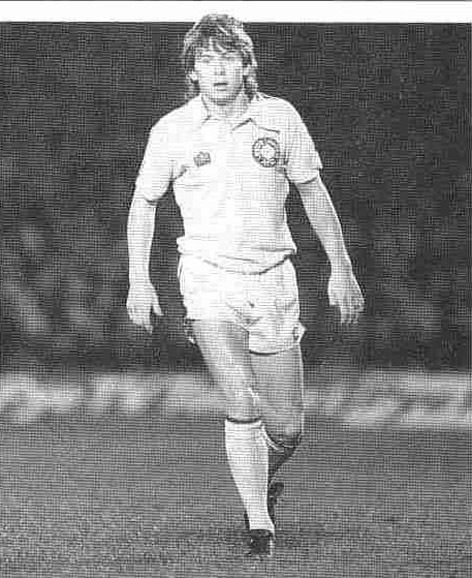 After seven goals in thirty-seven games, he moved to Leeds for £100,000 in September 1979 It was not an easy time to play for Leeds United as it was a time of great upheaval, but he won two caps for the Republic of Ireland, through parental qualification. He came on as a substitute on 26th September 1979 in a 1-4 away loss to Czechoslovakia and a month later he started against U.S.A. at home in a 3-2 win on 29th October1979, in what proved to be his final appearance for his adopted country. He left for Bolton Wanderers in October 1981 for £40,000 after generally underachieving at Leeds. He shone at Bolton Wanderers, top scoring with twenty goals in 1984-85, and making one hundred and fifty-seven appearances and scoring thirty-six, before moving to Derby County for £35,000 in July 1985. He played his part in Derby County’s Second Division Championship campaign in 1986-87, although he was loaned to Mansfield Town in November 1986, where he played six games without scoring. He returned to Burnden Park in August 1987, for £20,000, but was soon injured. He snapped the cruciate ligament in his left knee after only four games, and was out for nine months. After playing for Bolton in the Sherpa Van Trophy Final win over Torquay United at Wembley, and after scoring four goals in twenty-four games, he joined Cardiff City in November 1989 for £15,000 before a knee injury caused him to retire in December 1990. He scored once in twenty-five games at Ninian Park. His time in the game was, by his own admission, littered with fall-outs with managers, poor self-discipline and inconsistent performances. Chandler lives in Blackpool, is a youth justice worker, helping youngsters aged between ten and seventeen with criminal convictions back towards the straight and narrow. He is also a qualified counsellor.